Leading Exporter of double sided printing tape in kota, both side adhesive tape available in kota, double sided cotton tape, double sided stereo tape in ludhiyana, double sided mounting tape and both side adhesive tape available in ludhiyana from Delhi. We manufacture high quality double sided cotton tapes which are known for their high adhesive owners and Hugh durability. It is not only gives support but high bonding to the applied item. These are every popular in flexo printing, and gripping of object son different surfaces. These also have a high weather resistance. 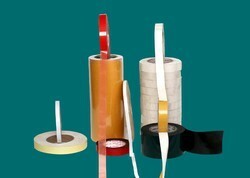 Tapes offered by us are known for serving the dual purpose of providing an interface material and attachment medium. Can be used on irregular surface.